The Sweetwater Authority is offering its customers rebates of up to $75 for leak repairs made during March. For details, go to sweetwater.org/fixaleak. Olivenhain Municipal Water District is providing its customers with free leak-detection dye tablets, drip measuring gauges, and short-flush toilet flappers through March 23. District customers may pick up those items at the district offices, 1966 Olivenhain Road, Encinitas. 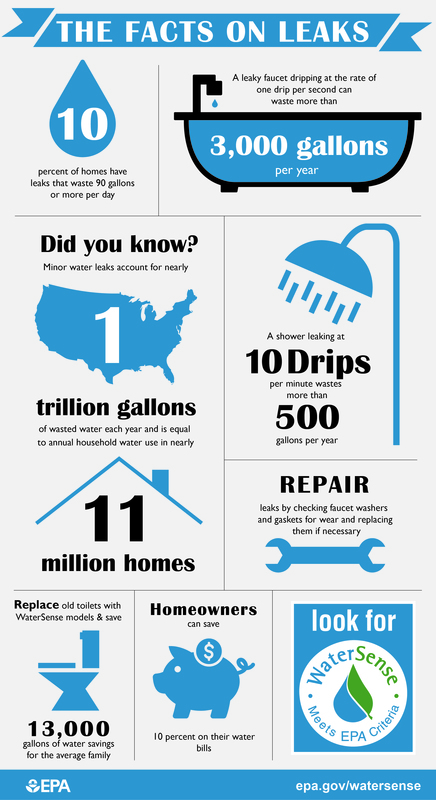 As part of national Fix a Leak Week activities that start March 19, home and business owners across the region can take advantage of free water-use checkups and other water-saving resources offered by the San Diego County Water Authority and its member agencies. WaterSmart Checkups include site-specific recommendations from certified irrigation professionals to address leaks and enhance water-efficiency in other ways. Single-family home assessments include indoor and outdoor water-use inspections, while commercial checkups focus on outdoor water use. Property owners decide if and when to make upgrades. Appointments are available year-round at watersmartcheckup.org. 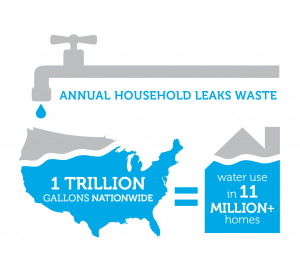 Even small leaks can create significant waste: Household leaks nationwide squander more than 1 trillion gallons of water each year, enough to serve the annual needs of 11 million homes, according to the U.S. Environmental Protection Agency, which sponsors the annual anti-leak week. 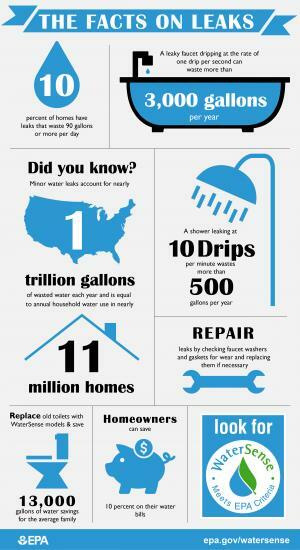 The agency estimates that a single drip each second from a faucet can waste more than 3,000 gallons of water a year. Irrigation systems also can be major sources of water waste: a leak roughly the thickness of a dime in an irrigation system can waste about 6,300 gallons of water per month. Outdoor leaks may result from broken sprinkler heads, along with dripping faucets and hose bibs. Common leak indicators include continually damp spots in the yard and mold or algae near irrigation fixtures. Property owners can detect less visible leaks by checking water meters before and after a two-hour period of zero water use at the property. If the meter doesn’t read exactly the same before and after, a leak is likely. In addition, many meters have a small, red “leak detector” that spins when water is being used. This may help to quickly detect small indoor leaks once all water sources are turned off, though it won’t always detect leaks in irrigation systems. The EPA offers a variety of leak-proofing resources, including: tips for spotting leaks; a guide to fixing common household leaks; and suggestions for addressing a known leak that can’t be pinpointed. For leaks or other water waste problems that can only be resolved with a new appliance or device, the EPA certifies water-saving products with its WaterSense label. A WaterSense toilet, for example, can save a typical household about 13,000 gallons of water per year compared to an inefficient toilet. EPA resources, including tips and lists of WaterSense products, are at epa.gov/watersense/fix-leak-week. Another resource for promoting water-use efficiency is the Water Authority’s “Live WaterSmart” smartphone app, a handy tool for quickly reporting outdoor water leaks and other forms of water waste that are visible around the region. The app allows users to send descriptions, photos and location details directly to the appropriate local water district so it can alert property owners about potential problems. Download the app at sdcwa.org/live-watersmart-mobile-app. Look for dripping faucets, showerheads, sprinklers, and other fixtures. Also check for toilets with silent leaks by putting a few drops of food coloring into the tank and seeing if it appears in the bowl before you flush. Don’t forget to check irrigation systems and spigots too. Replace fixtures if necessary. Look for WaterSense labeled models, which are independently certified to use 20 percent less water and perform as well as or better than standard models. 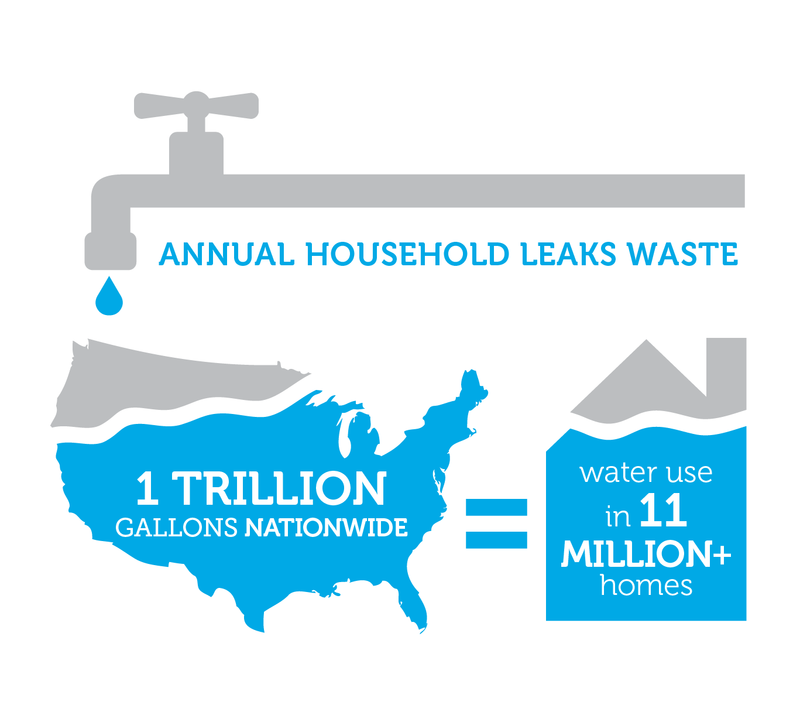 For more information about Fix a Leak Week, go to epa.gov/watersense/fix-leak-week.